The Chi is an upcoming Showtime television drama series, written, produced and starring Lena Waithe about life on the South Side of Chicago. It is being directed by Rick Famuyiwa. It will premiere on January 7, 2018. Ever since I first got to know her work on Master of None, especially the awesomeness that was the Emmy-winning “Thanksgiving” episode, which she co-wrote with show creator, Aziz Ansari, I’ve been down for anything Lena Waithe-related. Well now, she’s got her own show coming to Showtime, and it looks amazing! Check out the trailer above! The cast as they appear in the trailer look absolutely charming, and love that the show seems to strike a perfect balance between dealing with serious issues facing the black community in Chicago, and also letting the characters be light, and sometimes funny, and sometimes silly. Shocker of shockers: they get to just be people! Huh. Someone should tell the television industry that having creators from diverse communities creating shows about those communities provides more nuanced storytelling, amirite? Surely, they’ll wanna start doing this all the time! The Chi, which is co-Executive Produced by Waithe, Common, Elwood Reid (who will also serve as showrunner), Fox 21 TV Studios, and Aaron Kaplan through his Kapital Entertainment is set to premiere on Showtime on January 7th. Will you be watching? Although Showtime's highly-anticipated drama The Chi still doesn't air officially until the new year, anyone with internet access can now get an early peek at the premiere. The network announced on Friday that they've released the first episode of the Chicago-based drama ahead of schedule on streaming platforms including YouTube, Facebook and SHO.com, as well as through various provider portals, Showtime's On Demand channels and on the Showtime website. With Emmy-winner Lena Waithe and executive producer Common at the helm, The Chi centers on a series of interconnected stories featuring characters from Chicago's South Side, where the show was filmed entirely on location. (Showtime's release describes it as exploring "the humanity behind the headlines" of its real-life setting.) The show's ensemble cast includes Jacob Latimore,Alex Hibbert and Yolanda Ross. The first episode of The Chi is available now on the aforementioned streaming platforms. The series will also premiere as planned on Showtime on Sunday, Jan. 7 at 10pm/9c. Caught the pilot also and damn Lena didn't waste no time getting to it. Great first episode. 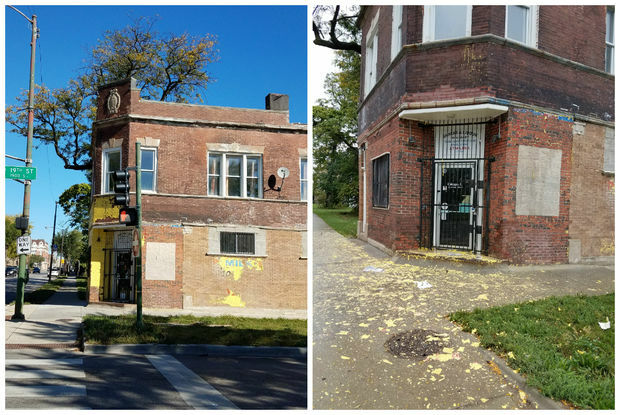 People living in a "food desert" in North Lawndale hoped they'd be able to get basic necessities from a new corner store (left). But the store ended up being a TV set, and this week the set dumped its props — including food and cleaning supplies -- into the garbage. CHICAGO — A set for a TV show that looked like a corner store stirred false hope in neighbors living in a West Side food desert — and then the show threw out a dumpster's worth of food and household supplies that decorated the make-believe shop, residents said. With no grocery stores available for many people in the area, and unwilling to let the items go to waste, North Lawndale residents helped each other pick through the dumpster Monday so they could bring home food to their families. The set at 19th Street and Kedzie Avenue led to frustration in the neighborhood this summer when residents mistook it for a real corner store, a much-needed business in a neighborhood where residents seldom see investment and have few, if any, options for buying groceries. "The Chi," which is set to run on Showtime and is produced by Chicago native and Emmy winner Lena Waithe, depicts life and its challenges on the South Side of Chicago. Neighbors questioned why the items weren't donated to a shelter or food pantry to benefit local families in need. "It is so shameful that a company like this is profiting off of a show about the hardships and struggles ... living individuals face living in Chicago," wrote Jayleen Sandoval, a neighbor of the set, on Facebook. 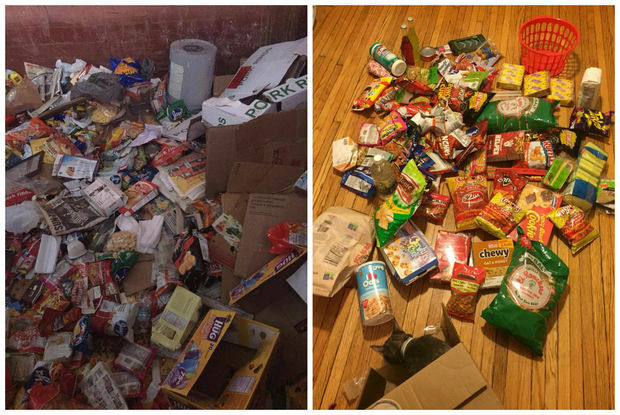 "It is even more shameful that the company failed to recognize that all the food and items they simply tossed could have been donated to the numerous shelters around the Chicagoland area INCLUDING the South Side." "Hey, someone can eat that"
The fake store has been in use since at least mid-June, but creators of "The Chi" finished filming there this week, and the show's very real props were apparently thrown out Monday. The trashed props — which had lined the "store's" shelves — included everything from canned tuna to sponges, cleaning supplies, diapers, condoms and snacks. It "hurt" to see how disposable everything was to the show's staff, said Kimberly Camacho, a Harold Washington College student who lives near the set. Camacho is a roommate of Sandoval. "It felt like they just got what they wanted and left," Camacho said. "I felt insulted." Representatives from the show did not immediately respond to a request for comment. Camacho, her roommate and their neighbors weren't going to let the items go to waste: They got into the dumpster and grabbed the items that hadn't been opened and contaminated. Camacho estimated the dumpster held enough items to help 40 families. Children poked around the dumpster, grabbing food for their families and avoiding trash and broken glass as adults told them what they should take, Camacho said. Camacho and her roommate were the only ones with flashlights, so they used their lights to help neighbors find items they needed. Camacho also grabbed food for people standing outside the dumpster, and residents helped each other get into and out of the dumpster so they could search. "I just don't understand how they can film about the South Side struggle and then not help the struggle," Camacho said. "I just don't understand what happened, what went through [the show organizers'] heads when they threw that all away. How did no one on the team be like, 'Hey, someone can eat that'? "It just seemed like common sense to give it to someone. ... How do you become so entitled that you think it's best or easier to throw it away and that it's not worth the effort to give that food to someone in need?" Camacho was able to get a packet of sponges she's wanted but has hesitated to buy because money is tight and there's few places where she can find sponges in the area. Laughing, she explained the pack of sponges make her feels like "we're set for life." "I was able to fill up two bags of food," Camacho said. Photos show her haul: Hamburger Helper, oatmeal, granola bars, cleaning wipes, flour and more. "When they threw away that stuff, it was basically like having a pantry in my yard. It should have been in a pantry in the first place or a woman's shelter — anything would have been better than" throwing it out. Camacho was one of those who had mistaken the set for a real store this summer, growing excited when she spotted it because she's "aware [North Lawndale's] a food desert." She'd look inside at the fake store's packed shelves and think, "Wow, wish I could have those chips," she said. The student quickly realized the store wasn't real and kept getting groceries the only way she often can in North Lawndale: visiting local food pantries, which requires waiting hours in line to grab household necessities, and spending hours coordinating twice-a-month visits to a grocery store in southwest suburban Cicero. The Cicero trips are a "hassle," Camacho said, but they're the easiest way she can access cheap groceries as a North Lawndale resident. There are no major grocery stores near her home. Camacho spends days organizing the trips with her sister: They have to find a date that works for both of them so they can help each other and share a Link card for savings, and they plan their purchases carefully since they'll have to go weeks without another visit to a grocery store. Traveling to Cicero might take almost as much time as going to a store in the city, but at least Cicero doesn't have the same taxes as Chicago does, Camacho said. The suburb's stores also give customers free plastic bags that Camacho can use for trash, saving her even more money. Before Camacho moved to North Lawndale in July, she lived in Irving Park. She could cross the street and be at a grocery store when she lived there, she said, but that's not the case on the West Side. "Here, you have to plan the day out to get your carts, your bags. If you don't plan correctly, you don't have enough bags for all your stuff or enough space in your cart," Camacho said. "I didn't know how good I had it" in Irving Park. Camacho — who considers herself privileged compared to other North Lawndale residents since she has a Link card and is able to make trips to local food pantries — said going through the set's dumpster saved her having to wait in long lines at food pantries. It was even more helpful for others who aren't as privileged, Camacho said. "It means a little more time in their day because they don't have to plan to go get those items, or ... instead of spending money on the food they got from the dumpster, they can dedicate [that] to maybe buying their kid a book or treating them to a muffin or something. Something that they can't have in everyday life," Camacho said. The end of filming brought another frustration besides the thrown-out food: Camacho said the store's painted exterior was washed away last week, but the cleaners left paint chips over the sidewalk and grass in a family area. Camacho was "angry" about the leftover mess, she said, comparing it to a guest making a mess and not cleaning up. The paint chips were cleaned up some more by Monday, with some yellow still visible in the grass, but that was because neighbors went out to clean, Camacho said. "People in the community were sweeping" the paint chips away, Camacho said. "They like to keep the neighborhood clean. "It showed that they had pride in our neighborhood, and it's not just something to make money off of. To them, it's not the 'hood. To them, it's their home." gry60 and hand2handking like this. jape and hand2handking like this. Just saw the first ep. Nothing like The Wire imo. Its vaguely similar in that it covers the storiss of multiple characters from children to grown folk. But hell, a lot of shows did that. Anyway, it was a good first ep. The cycle of killing was pretty ****ed up. Although, I don't feel bad for the kid given the scumbag move he pulled. Marking my spot in this thread. About to check out the first episode right now. harlemtothebronx and Magic33 like this. As a South Sider, didn't like the sensationalized, forced campy drama of the pilot. Yeah they really did dive right away in to some stereotypes and cliches but it was handled/executed well. Having watched the pilot, I might have a hard time watching Shameless and this at the same time and look and take Shameless somewhat seriously. I know it's a comedy, but it's a reality based comedy and the tone of that vs The Chi are polar opposites in the same part of the city. Crazy how Showtime did this, but we'll see how it goes. I think cuz Shameless is Shameless that it'll be fine for me. It takes place in the same city but not the same neighborhood.